I love working from home. 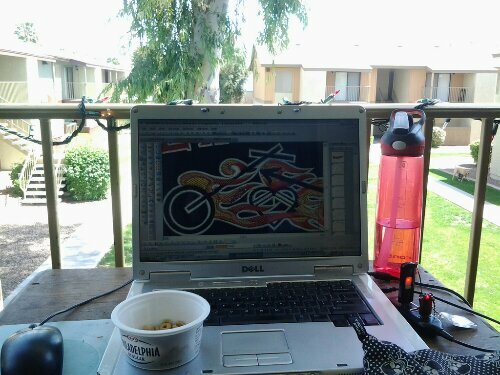 I can sit in my pjs on my patio and enjoy this beautiful arizona weather while working on my latest embriodery design. 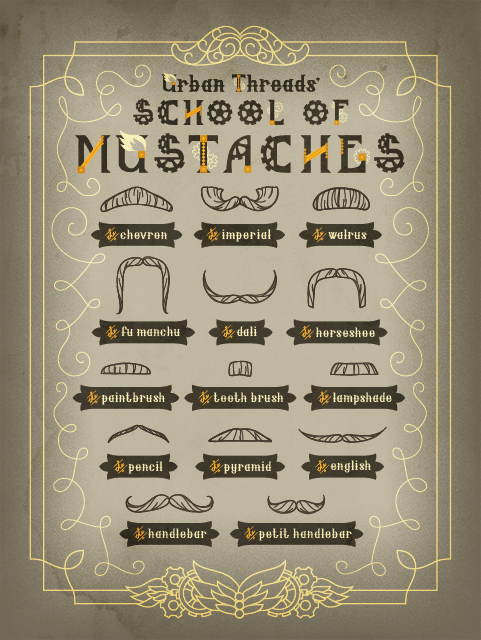 We thought we would offer another FREE wallpaper design to celebrate March and our latest Steampunk Alphabet collection. This design was made by our talented artist Danielle! She helped design the Steampunk Alphabet and decided it was too much fun not to create a snarky poster out of it (and other crazy things like THIS). As a special treat, we have it available as a letter size poster print that you can print out and stick on your wall too! Click the image below to get that poster print. Loving that alphabet and all things Steampunk? Don’t forget they’re all ON sale now through Sunday, March 24 at 11:59 p.m., Central time. </a>I like fingerless palm gloves, but I have a hard time finding them. Most of the mass produced gloves/ armwarmers are too long, too tight, or bad fabric. So I started making my own. I’ve made several pairs, and now that I think I have the kinks worked out, I want to share this easy how-to with you. Need: Needle, good shears, microfiber socks or any stretchy sock that fits over your hand, matching thread. I used plain 99 cent socks from the local thrift store, but you could use tiedye, stripes, or unicorn farts and bunnies if you so desire. This is a good reuse of socks that wear holes in the heel or toe, because that part gets cut off any way. Start by triming off the anckle part of the sock right at the heel. As you can see, the formed heel will limit where you cut at, but you want to get as close to the heel as you can to ensure a good length to the glove. Turn the tube inside out and slide it onto the fingers of your off hand with the raw end towards your wrist. Turn down about 1/2 inch of the raw edge. This will be the new seam that lay across your knuckles. Using a whip stitch, work your way around the raw edge. Run the needle at a right angle to the raw edge. This way the threads will lay diagonally on the under or ‘wrong’ side (which is currently facing you), but will lay straight on the right side. If you keep the threads straight, they should blend in with the knit of the sock (which is why I had to use white thread for the demo, the threads blended in -too- well). Now slide the sock onto your hand. You can try to with the new hem and the old hem towards the fingers to see if it makes a difference, but whichever you choose, make sure you have both socks the same direction before cutting the thumb hole! With the sock on, mark the place where your thumb sticks out the most. Cut a TINY HOLE at this spot. Socks are stretchy, and it only takes a few cut threads to open up to a thumb sized hole. I wanted most of my thumb base to show too, so my hole is the size of the cap of a marker (smaller than an American dime). If you want just your thumb, and not the base, to show, you will want to make a SMALLER HOLE. Position the tube so that it sits where you want (close to the knuckles? over the knuckles? across mid palm?) mine is set to go over the knuckles. Cut the spot directly over your thumb knuckle. This spot. the one the skizzors are pointing at. Carefully put the wrong side out sock on your fingers again (be gentle as runs may occur) and fold back the raw edge so that it lay on the wrong side (you will have to fold it back as you sew) and start a whip stitch around the edge in the same way as you did for the cuff. You can run a running stitch around the hole first to hold the edge where you want it, but in my experience the running stitch will have to be removed to allow the sock to stretch around your thumb. Tie the ends off and you’re good to go! This would be a good time to point out how much of my thumb sticks out of that TINY HOLE I cut earlier. Like I said, socks is stretchy. Oh, and why to do with the rest of the sock? Make a big hair tie! I removed the toe and heel seam, folded the resulting tube in half with right side out, tri-folded it with the raw edges in the middle and added a couple knotted whip stitches about every inch to hold the ends together. Or you could just roll the tube from one end to the other (like how pantyhose roll up when you’re taking them off) and leave the raw edge to fray naturally. I was kinda suprised at how good of a hair tie it is.